"PostgreSQL 9.0 allow you to have replicated hot standby servers which you can query and/or use for high availability. While the main components of the feature are included with PostgreSQL, the user is expected to manage the high availability parts. repmgr allows you to monitor and manage your replicated PostgreSQL databases as a single cluster." 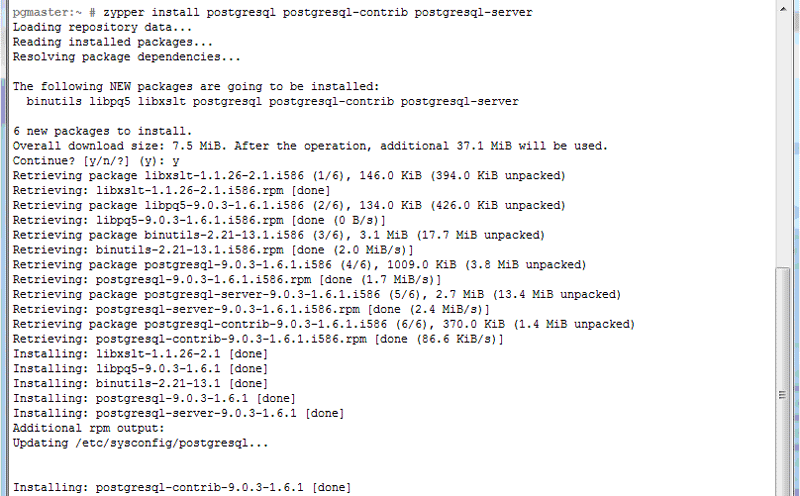 I would like to give most of the credits to postgresql community and all the contributors like 2ndQuadrant. You guys did a wonderful job for the SR hot standby features on postgresql database. The work I did on this tutorial is just make postgresql SR hot standby replication works on opensuse 11.4. I wish this tutorial could help more people start to use postgresql, the most advanced database, also Opensuse, my favorite OS like Debian. In this tutorial I will run 2 OpenSUSE 11.4 32-bit bare bone servers under VMware Workstation, both servers were built from OpenSUSE 11.4 network installation iso, which you can download from http://www.opensuse.org. And modify /etc/hosts in both servers to have above 2 records. Make sure you log out from the remote ssh server after your test. Now restart postgresql, and create a test database for replication use. 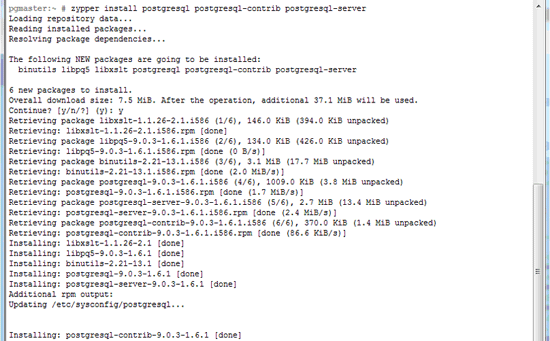 Now postgresql has been installed correctly on both the master and slave server. Time to install the repmgr management program. You need to download the source code from 2ndQuadrant website, and compile it yourself. Thank you for the informative step-by-step tutorial. I found it very helpful in setting up and understanding repmgr and what postgres configuration variables are pertinent to streaming replication. One think I would note about your postgresql.conf settings is the the `wal_keep_segments` value you are proposing seems to be excessively high. as is recommended in http://deepakmurthy.wordpress.com/2011/06/03/postgresql-hot-standby-replication/, and the PostgresQL documentation itself. The pg_xlog went from consuming 47GB to only 7GB afterwards, and the slave continues to sync with no problems. hot_standby ignored on a master server. Your post helped me a lot. Thanks!